As the estate was once owned by the Knights Templar, the (completely unfounded) rumour is that the tree grew from a seed collected from the Lebanon during the Crusades. The house was probably originally a farmhouse which has, over the years, been enlarged and extended. In the Sixteenth Century it was part of estates held by the Saunders family and in 1603 it came into the possession of Timothy and Mary Doyle (née Saunders). The Doyles were also wealthy local landowners. 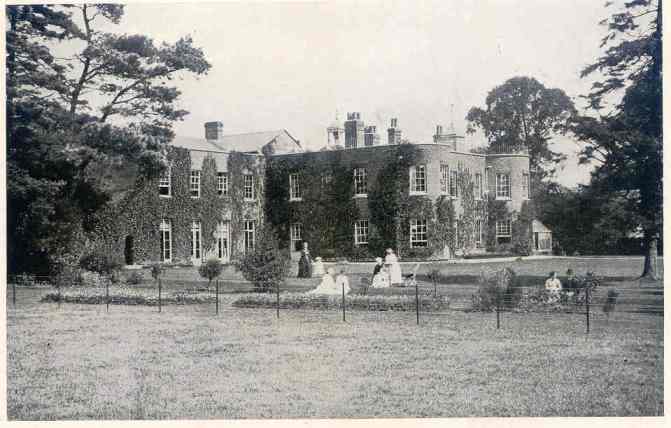 The Doyles remained at Parmoor for 200 years and created a large brick and flint manor house which they then augmented with a Georgian extension. In 1860 the house and 400 acres were purchased by Henry William Cripps QC who was fond of country pursuits and wanted a family home for himself, his wife Julia and their 10 children. However, he found that the house being in two parts was extremely inconvenient so he set about demolishing much of the original brick and flint building and remodelling the house completely. 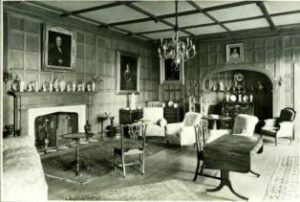 The only relics of the older house are one brick and flint wall, the oak beams in the kitchen and the oak used for the banisters and newels in the hall staircase and some of the bookcases in the library. This oak was considered to be of great age. Henry William added a new kitchen and servants hall and then in 1868 added another wing to provide a dining room with bedrooms for the children above. 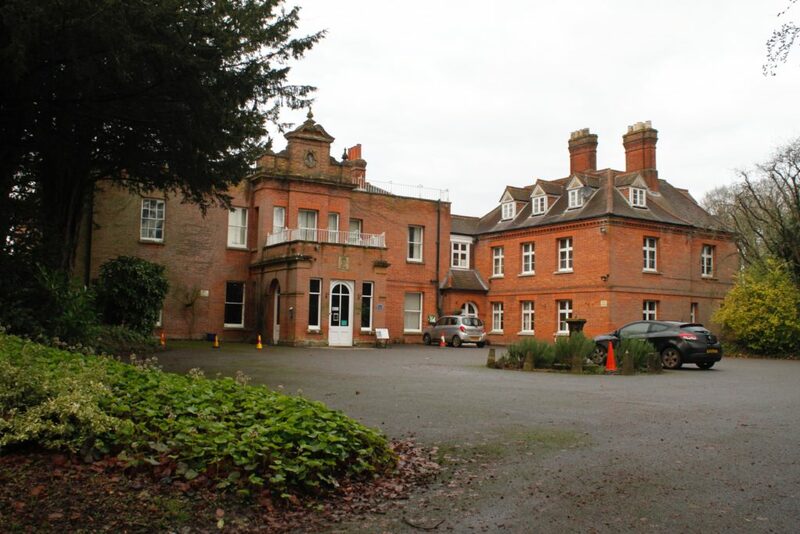 When Henry William and Julia retired to a smaller property in Marlow their third son, Charles Alfred Cripps QC, bought the house and estate from his father. Charles Alfred Cripps was a politician and as well as providing a home for his wife Teresa and his children, he also used the house to entertain the ‘great and the good’ of the day. He extended the house further, adding a large banqueting hall with a suite of guest rooms above, he panelled the dining room which his father had built, added embellishments to the staircase including a large stained glass window and remodelled the entrance to the house. His interests included science, ecumenism, he held high lay-offices in the Church of England, and of course politics. In 1914 he was created Baron Parmoor of Frieth and became the first Lord Parmoor. After the Great War he was involved with the Peace Conferences and was instrumental in the founding of the League of Nations which later became theUnited Nations. 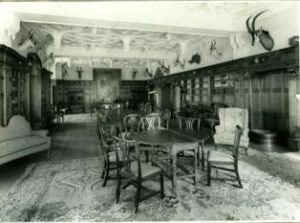 Many famous people have visited Parmoor House, as it was then known, including Lord Baden Powell, Albert Einstein, Haile Sellassee, Jaharwal Nehru with his daughter Indira, and of course family members including his sister-in-law Beatrice Webb with her husband Sydney and his youngest son, Stafford, who as post-war Chancellor of the Exchequer Sir Stafford Cripps, is probably the most remembered member of the family these days. Lord Parmoor died in 1941 and Parmoor House was then let to King Zog of Albania, who was forced into exile when Mussolini invaded Albania in 1939. King Zog lived at Parmoor with his Hungarian wife Queen Geraldine, their young son Prince Leka, members of his family, their servants, bodyguards and pets. His retainers lived in Little Parmoor, and his Ministers and their families were billeted to houses around Lane End. Along with his retinue, King Zog also arrived with seven crates of gold which were probably stored in a small strongroom in the cellar. King Zog improved the kitchens and had a bathroom installed at Parmoor House, but otherwise left it unaltered. Parties were held at the house, and visitors included members of the Cripps family, government officials and sometimes other exiled heads of state including General De Gaulle and Queen Beatrix of the Netherlands. Queen Geraldine and other Catholic members of the group attended the Catholic chapels at Wheeler End and Marlow. 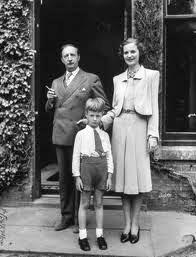 King Zog and Queen Geraldine often attended the cinemas in Marlow and High Wycombe. Prince Leka had a Swiss governess and some local people remember being invited to play with him at Parmoor House when they were children. He was tutored by the headmaster of Lane End School. King Zog relinquished Parmoor House in January 1946, when he moved to Egypt. The house then lay vacant for a year. On February 11th 1947 the second Lord Parmoor sold the house and 12 acres to the Community of St. Katharine of Alexandria, a High Anglican Religious Community who had been bombed out of their previous home in Fulham, London. They were to remain there for 51 years. 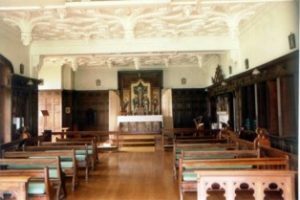 A great deal of alterations had to be made, including converting the banqueting hall into a chapel, and the house was renamed St. Katharine’s. The original work of the Sisters, which was looking after the poor and girls needing help, was no longer able to be the main secular work of the Community. Caring for elderly ladies continued however, and twenty ladies could be accommodated within the house. The sisters took part in parochial activities and ran a Sunday School at Hambleden church and Women’s Fellowship in the parishes. Mass was said daily, with a Sung Mass on Sunday and other Holy Days. The last surviving member of the Community, Mother Christine, died on March 17th 1998 and is buried in the Sisters cemetery, which is in a corner of the garden, alongside the other sisters of the Order. In 1995 Mother Christine gave the house and grounds, now a Grade 2 Listed Building, to Lady Ryder, better known as Sue Ryder. She accepted it on behalf of The Sue Ryder Prayer Fellowship, an independent charity which is quite separate from her better known eponymous charity. The Fellowship was conceived by Lady Ryder to be a “spiritual powerhouse” for the needs of others. People from all walks of life come to Parmoor and in the spirit of ecumenism and reconciliation we welcome those of all denominations, or none, for day and residential visits. The house currently has a small permanent staff which is supplemented by volunteers. With their help the house is being renovated and refurbished. The main ground floor rooms provide pleasant venues for large or small meetings, seminars and retreats while the guest bedrooms have been upgraded with ensuite facilities. The house can be used for private functions but most guests come in parties or individually to enjoy the rural tranquillity. In the grounds, the walled garden is being brought back into productive use and supplies vegetables and fruit for the kitchen. The outline of a formal garden has been uncovered and is being made into a sensory garden by Lane End Elim Centre Oasis Project while a large sunken garden awaits restoration.